Many of you must have watched Michelle Phan, the American Beauty Guru on YouTube. She is one of the pioneers in the YouTube beauty world, with more than 7.5 Million subscribers, the 27 year old Beauty Guru and entrepreneur was also featured in Forbes 30 under 30 list for 2015! YouTube has brought the beauty industry to a whole new level. There are so many successful YouTube beauty Gurus who teach their viewers and subscribers about Makeup techniques, skincare and various products available in the market. After a very successful collaboration with Lancôme in the year 2010, Michelle co-founded ‘MyGlam’ in the year 2011, which was later renamed Ipsy, which is a monthly beauty product subscription service. Michelle created Ipsy for people who wants to try out different beauty and skin care products to find the right one for their needs. The Ipsy site has a beauty quiz section in which the members fill out information about their skin tone and product preferences. A team of experts choose 5 product which includes deluxe samples and full sized products which are new in the market and the members get to try those for for just $10* a month. Glam Shadow, and Crown Oval Concealer Brush (C224). Out of all the products I am most excited about the BB Cushion and the concealer brush. I previously have tried GlossyBox and I love the packaging of it as its like opening a gift which it always a pleasant experience and you can use the pretty box as a keepsake but it it $21 a month. 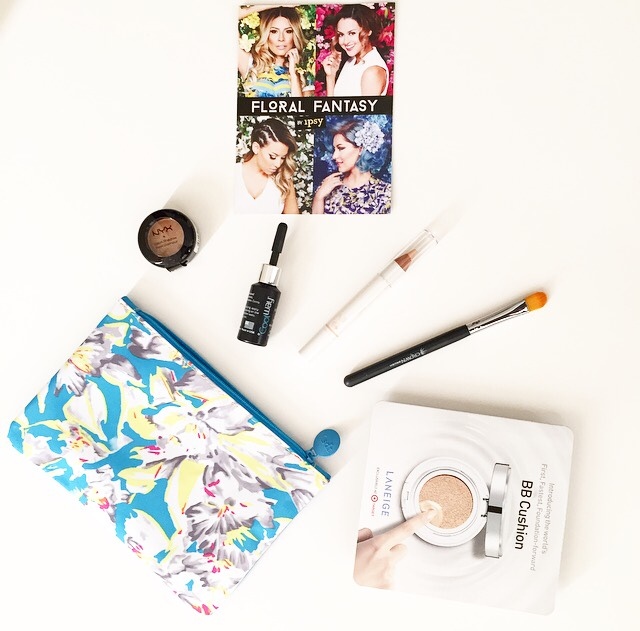 I like Ipsy as its cheaper and I get to try new products every month which is always a treat. Although Ipsy comes with a list of products with detailed product description, how to use it and the price which wasn’t available with Ipsy which is a little annoying, I wish thy start doing it too. If you are considering trying one of the beauty subscription I recommend watching various reviews and unboxing on YouTube which would definitely help you get a feel of what to expect. Thank you for reading this! I would love to know your views and experiences with various beauty subscriptions in the comments. What exactly is the BB cushion? I’m intrigued- is it like a pressed powder BB cream or a mousse? I’m looking to lighten up my base for warmer weather!